Support Backbone State Park by signing up for this 4-ish mile run. It's a challenge, it's beautiful, and the profits go to keeping the park looking as good as it did 100 years ago. Let's hit the trails and get gnarly! Download and mail a paper registration here. No refunds. Will run rain or shine. 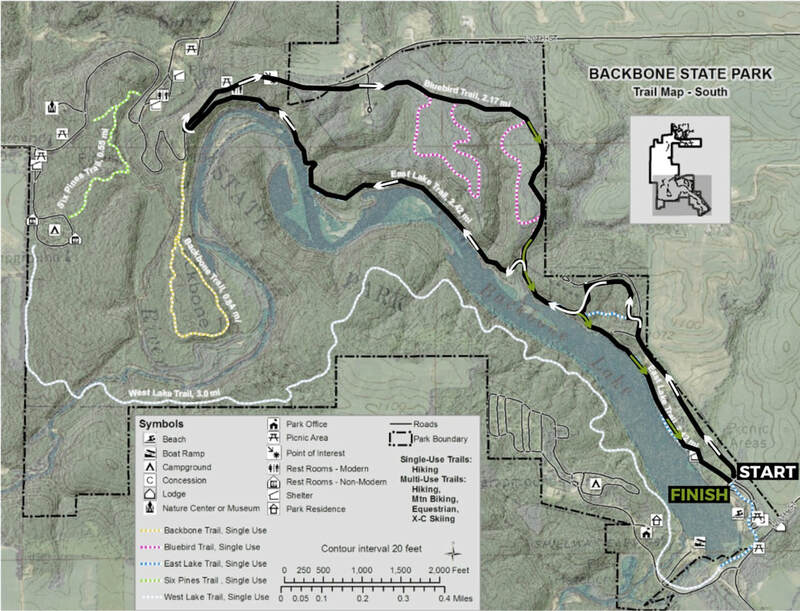 This 4ish Mile Run will take place on two of the many trails Backbone State Park has to offer. Starting off on East Lake Trail you will run, or walk, in the beauty of the trees and rocks with the lake off to your left. Then comes the Bluebird Trail, this trail takes you within the prairie. Wide paths and tall grasses make this part of the course a nice scenery change. Backbone Friends Group is a non-profit organization who's mission is to promote and support the activities of the Upper Maquoketa River Alliance and related organizations and agencies with similar natural resource concerns. To promote the general social welfare of the counties through the establishment, operation, management, and maintenance of properties as conservation and education demonstration areas. To promote and assist economic development related to the areas natural, historic, and human resources. Yes! This course is a challenge so you won't be the only one. To Backbone State Park of course! The Backbone Friends Group provides funding for projects that the normal park budget cannot absorb. These projects and purchases have assisted in the protection of the parks watershed, provided promotional support, purchased items that improve park visitors experience such as playground equipment, trees, and much much more! Your question not answered above? Please contact us! Like Backbone Lake Friends on Facebook!